Blackgate, the last unit in the square. S&PBargain, Hollings Rd, Bradford BD8 8PW. Collection and viewing. Bosh Dishwasher NO RESERVE. £9.99 STARTING BID! Bosch Dishwasher SMS40C02GB, freestanding, full size, White. Condition is Used. This dishwasher is 5 years old and fully working. We are having a new fitted kitchen and so this is no longer required. The buyer must collect from the Nottingham area, preferably on Easter Monday or in the evening of the Tuesday/Wednesday after. I also have an American Fridge Freezer for sale. If interested please see my other listings. EcoSilence Drive: powerful, durable, quiet and efficient. Condition is used but in excellent working order and very presentable for your kitchen. It is about three years old and has never had a problem. Still being used so any demo given if needed. 50cm depth. 45cm height. No longer required as replaced with an integrated unit. Dishwasher Bosch Exxcel. Condition is Used. Free standing, full size (600mm). Used but Good Working Order in white. Collection or Delivery charge extra (within 5 mile radius). Generally in good condition. I am only getting rid of it because I have changed my kitchen and now have a built in Bosch dishwasher. hoover dishwasher slimline excellent condition 18 months old. Condition is Used. Collection in person only. This is a 2 year old machine that was no longer needed due to a closure of site.machine has had very little use as was installed in a staff tea room. hence it is very clean and tidy.machine has been fully checked and tested by a fully qualified miele service engineer. For sale is a SKS62E12EU Table Top Dishwasher in excellent condition. Moving house so no longer required. This glass protection and water softening system ensures optimal results when washing your glassware. Minor (allbeit unnoticeable) transportation marks, as shown on pictures. Collection in person only. contents: x1Currys Essentials CDW45W18 Slimline Dishwasher. TheCDW45W18 features an automatic water softener, so no matter how hard the water is in your area, you can be sure you dishwasher will work perfectly. AEG 60870 Sensorlogic Dishwasher with Stainless Steel Front Panel. Fit under a standard 60 cm unit. Condition is Little Used and is Excellentand being sold only as we are changing to a built-in dishwasher. Bosch Exxcel dishwasher. Condition is Used. Collection in person only. Spares or repair. Works but doesn't rinse properly. Dishwasher Type Standard Size. Place Setting Capacity 13. Above 150 Coastal areas, Devon and Scotland etc. 150 from Birmingham City Centre. Miles (up to). Hot Air Dying System Yes. Softline Worktop, Removable Yes. It has a few scratches as you can see on the pictures but it is in fully working order. No longer required, as we have built in dishwasher, after moving house. From IP23, Diss area. Full size machine. Whirlpool Dishwasher. Condition is Used. No longer required as have moved house and could only fit compact dishwasher. Works perfectly, damaged on corners during move. Cash on collection only please, buyer to collect. Fits in estate car. Also advertised elsewhare Thanks for looking. New listingHoover HEDS 968 (White) 45cm Slimline Freestanding Dishwasher White. Good condition. NW5 COLLECTION ONLY. Zanussi Dishwasher. Tempoline model in white. Full size. Very good condition. All racks present. Used daily until recently due to kitchen refurbishment. The SN25M231GB is a very large dishwasher suitable for any family, with a large capacity and a diverse platform for washing any pots and pans you need to. Part Number SN25M231GB. Standard Capacity Cycle 12 Place Settings. Condition is Used. Full specifications. The CDW45W18 features an automatic water softener, so no matter how hard the water is in your area, you can be sure you dishwasher will work perfectly. Technical specifications for ESSENTIALS CDW45W18 Slimline Dishwasher - White. In good working and clean condition with child safety lock, 12 place settings, fitting under a 60cm deep worktop. Reason for sale is new kitchen fitted with an integrated dishwasher. Collection from Bracknell RG12. Miele Semi Integrated Dishwasher. Condition is Used. Has been in perfect working order until recently. Still washes fine, just get an error message every 4th or 5th wash saying “F70”. Have told can be fixed easily. So great for someone to fix and use, fix and sell, or for parts. Collection only from Leigh On Sea in Essex. Condition is Used. Another item left in the house we bought 3 years ago. Fantastic dishwasher with huge capacity - much better then the integrated one we have now but apparently it HAD to be integrated! Awarded a Which?. 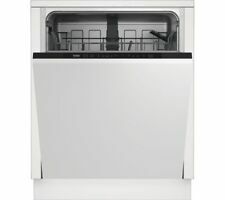 White Knight Dishwasher DW1460WA Which best buy. Compact Dryers. Do not book any fitting of products prior to having the product in your possession. Milk Frother Machine. The carriers will not call prior to drop off.